This image, taken with the NASA/ESA Hubble Space Telescope, shows the young planetary nebula Henize 3-401. 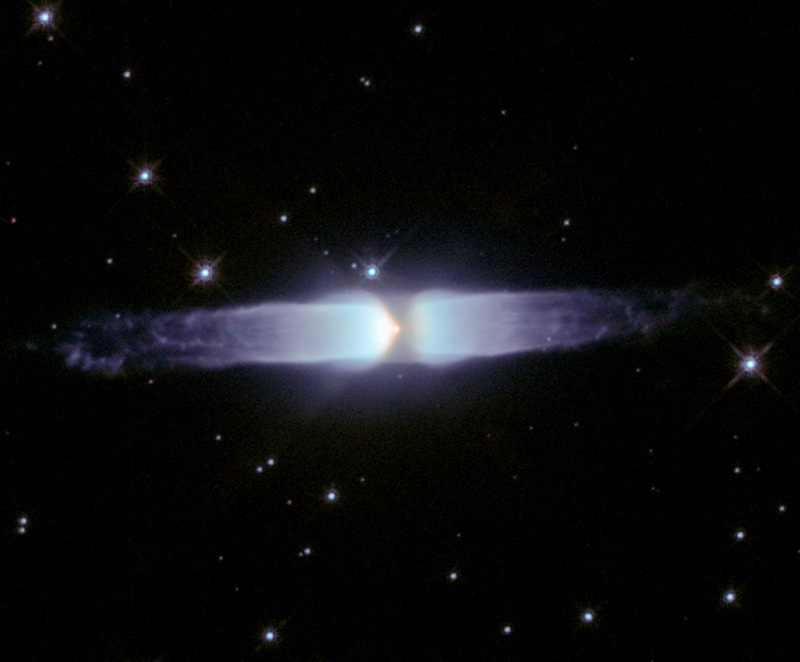 Hubble's extraordinary vision reveals that it is one of the most elongated planetary nebulae found so far. The image shows two very long cylindrical outflows with intricate thread-like structures and tattered ends. We are seeing the central star responsible for the beautiful display for the first time in this image. Henize 3-401 is located in the constellation of Carina (the Keel) at an approximate distance of 10 000 light-years. This picture is composed of three exposures obtained with Hubble's Wide Field Planetary Camera 2 on 12 June 1997. The three exposures were taken through a wide orange filter (1200 seconds) shown in blue, a hydrogen-alpha filter (400 seconds) shown in red, and a singly ionised sulphur filter (1200 seconds) shown in green.